Flood waters are rising and the long-term damage they leave in their wake can swamp homes and businesses. Luckily, there is an outpouring of ways to prevent contamination or serious destruction. To start, you’ll need to assess the damage. After you are able to review the situation, it is vital that you eliminate the source of the water as well as any excess water. Next, you’ll need fans, because it is time to dry the area where the flooding occurred. It is important to remove dirt, debris, and the mold and mildew stains that might have accumulated. If your water supply is limited, it is important to stick with ready to use cleaners. After you’ve cleaned, it is time to work on mold prevention. Disinfectants are your best friend when it comes to preventing mold and mildew. When you’re ready to start repairing damages, you’ll need to determine if a professional is needed. It is important to pay special attention to the source of where the flooding began so that future flooding can be avoided. 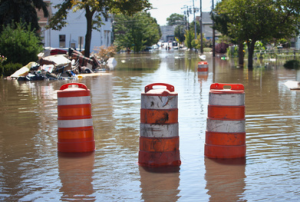 This is just a brief rundown of what to do after a flood. For more detailed information on what you can do and what products will help, see the flyer below.